We welcome feedback from all our guests. Here's a selection of comments from people who have stayed at Methven Motels. We stayed at this Motel twice in the last week. Rooms were great, roomy, clean and very comfortable. Were allowed to check in early as we were going to a wedding. Hosts were very friendly and made our stay there wonderfull. Would come back again and recommend highly. Well done Methven Motels for being one of the 5 finalist in the Corporate Events Guide for the best motel in N.Z.. After staying with you I can see why. Fantastic Accommodation - we have been to a number of places here in the South Island, and this was BY FAR THE BEST!! CLEAN!! Just a quick note from a very cold and windy England to say a big thanky ou for the excellent service during our stay in Methven. The unit was the best one we stayed in throughout our travels and the view from the balcony of the snow capped mountains was breathtaking. Great accommodation. After trying a couple of places in town we settled in at the Methven Motels. That was it, go no further. Modern, clean, comfortable and affordable apartments. Loved our stay there and made it our first choice on the next couple of visits. 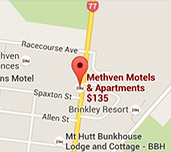 Have recommended Methven Motels to anyone heading to Methven. What a find. The staff are very friendly and welcoming. The units are modern and the facilities are great. We cooked most nights and saved a fortune on eating out.. The spa and the heating were wonderful. The staff went out of their way to help us with all our enquiries, for which we are eternally grateful. The town is a short walk from the apartments. The units themselves are very sound-proof, which is great for sound sleeping. The view of Mt Hutt is amazing. We have stayed in other accommodation in Methven and this is the first place that I would recommend. Thank you for a most enjoyable stay. The best Motel we have stayed in during 8 years of visiting NZ. thoroughly enjoyed our visit. Clean, towels and bed linen changed regulary, comfy bed. Friendly and helpful service, Quite but central location, plenty of parking space. Keep up the good work. Came for 1 nights stay, stayed 2 as it was so lovely and peaceful. I will tell all my friends about your great Motel and what a lovely place Methven is. 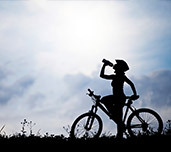 Enjoyed doing the cycling tracks. I travel around alot and stay in many Motels, this has to rate among the best. Thanks for a lovely stay. Another 3 week annual skiing holiday spent in Methven. As always our accommodation choice was Methven Motel and apartments where we are always made to feel very welcome by host Linda, Gary and Caroline, along with a very clean, comfortable and well equipped self contained room just a short walk from the village. Out of the 20 Motels we stayed in this was the best. Would recommend. The best Motel we have stayed in on our visit to New Zealand. Wished we could have stayed longer. Thank you for the magazines, I read some interesting articles. Thank you too for your well presented and cosy motel room. We enjoyed a good rest after the stress of moving from our home and the repair process by EQR. Alison & Russell Thomson, April/2013 Thank you very much, great room, one of the best we have stayed at in a week. Thank you for your wonderful hospitality. We really enjoyed our stay at your Motel. You and Gary are the absolute opposite of Basil and Sybil Faulty. It was a joy to meet such caring and humane people. I am about to buy a new mattress and was so impressed by yours could you please let me know the make and model. Thanks again for a wonderful holiday. Stayed here for one night in Jan 2015. What a lovely room and all New Zealanders were very kind and welcoming. Just had to give Linda a hug before I left as she was very kind and helpful. Have been traveling in N.Z for 5 weeks and this was the best bed I had slept in. Lovely units, very quite. 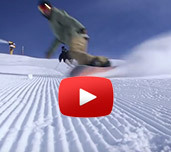 I have stayed at Methven Motels a number of times this winter, as a base for skiing at Mt Hutt. Initially I chose Methven Motels because it is modern and well presented and the rooms have facilities like a kitchen, a bath, wireless broadband, and DVD and CD player. After my first stay, I returned a number of times because I really enjoyed staying there. It’s a short walk to the restaurants and pubs, it has convenient parking, it’s clean, tidy and well maintained, it’s well run, and it’s warm, comfortable and very quiet. Methven village atmosphere appeals to us, Methven Motels quite but close enough to town for a short walk. Loved Spa bath, quality towels and friendly service. Will be back. Fantastic Motel to stay in. very central very friendly service . Enjoyed our stay immensely. Fantastic service with a smile. comfy beds, very modern, felt like we were at home. Overall very happy and we will come back. Heard it was the best place to stay, came highly recommended. Lived up to expectations. Stayed at many Motels and this rated among some of the best. Owners Gary, Linda,Caroline were very friendly and if you require anything you only had to ask. Great say. Thank you.